Sharing the life-changing teachings of yoga is my own humble way of practising seva, or loving service, in my life. It’s part of my yoga practice. Therefore 100% of profits from book sales and from workshops and seminars I give go to worthy non-profit causes. Here are two projects especially dear to my heart. Food for Life Vrindavan has been working in India since 1991. In rural India, girls without an education face intense hardships. Food for Life Vrindavan (FFLV) is a registered non-profit that provides free education, meals, skills training and medical help to over 1500 girls in Vrindavan, India, not far from one of the temples and monasteries in which I studied as a boy. FFLV aims to keep girls in school until they are 18, to offer them better prospects and prevent child marriages. While living and travelling with my teacher, I witnessed his tireless dedication to translating and elucidating the most sacred texts of the Bhakti tradition. I used to help him by entering his corrections in Hindi and preparing his manuscripts for him. This gave me a deep appreciation for these treasures on Bhakti-yoga, the yoga of loving service. 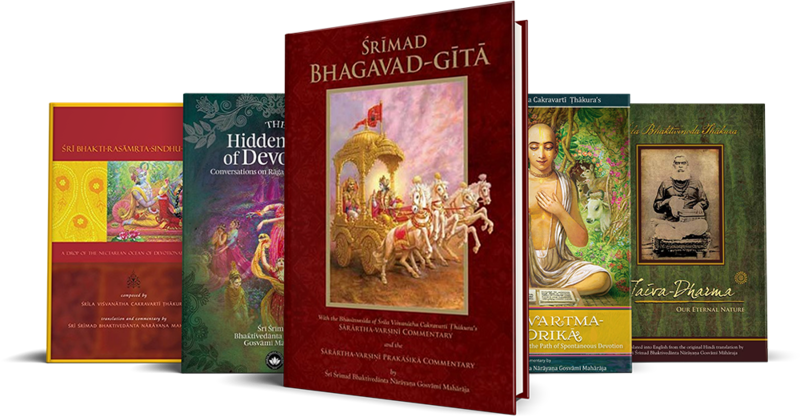 Gaudiya Vedanta Publications (GVP) is a non-profit publishing group dedicated to making these sacred masterpieces widely available in English and Spanish.